This saddle combines the swinging fenders, genuine sheepskin panels, and saddle skirts from Western saddles with the suspended seat and poleys of Australian saddles. 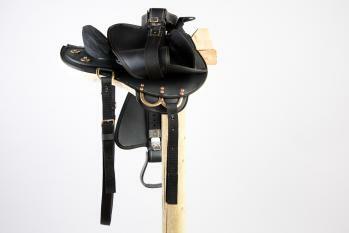 What you wind up with is a super comfortable saddle that has Western looks with Aussie safety! Made from a quality smooth, synthetic material and brass fittings. The Crossover has a trail horn and plenty of attachment points for your gear (horn is not suitable for roping). The Crossover works best with medium to low withered horses.